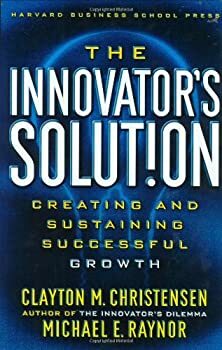 I have been listening to Clay Christensen and Michael E. Raynor‘s book “The Innovator’s Solution: Creating and Sustaining Successful Growth“. Really impressed with the systematic approach to innovation and why innovation can be categorized and built within existing companies or even in Startups. I believe this book is one of those classics that outlines how anyone from Venture Capitalist to Startup Founders to Managers of Businesses or CEO’s can bring a culture of innovation into any organization. This is clearly important given the changes that we are starting to see. I believe this way of thinking can really help entrepreneurs as well, there are some theoretical and empirical frameworks that suggest that Sustaining innovation is rarely the realm of startups and Disruptive Innovation is rarely the realm of incumbent businesses. One of the first question that I ask a startup founder or entrepreneur is if his idea or business is disruptive, if it is not then I suggest they do hypothesis testings to make it disruptive otherwise it is a fools errand trying to beat an existing business with a 10% or 15% improvement in the startup’s offering. For a startup to really disruptive it needs to be good enough but has dramatically different pricing, convenience or value being delivered to the customer. The internet itself is a sustaining innovation, whereas Cloud Computing is a disruptive innovation. I believe what Elon Musk has done with Electric Car technology is also very disruptive. I think it will be not long before Electric cars become a main fixture of our culture. I highly recommend the book and I think VCs, Entrepreneurs and Angel investors who are serious about investing should really read the book and try to understand the solution for the Innovator’s dilemma presented in this book. It has opened my eyes to transformational views of startups and investing in startups. I find that the word “Disruptive” to be unclear or at least I have never gotten a good explanation of the word. Sustaining technologies improve the performance of established products, along the dimensions of performance that mainstream customers in major markets have historically valued. Most technological advances in a given industry are sustaining in character. On the other hand Disruptive technologies bring to a market a very different value proposition than had been available previously. Generally, disruptive technologies underperform established products in mainstream markets. But they have other features that a few fringe (and generally new) customers value. Products based on disruptive technologies are typically cheaper, simpler, and, frequently, more convenient to use. You are welcome… when are you back?